These days, we can hear a lots people talking about Town Hall 8.5 and 9.5. So what exactly they are? 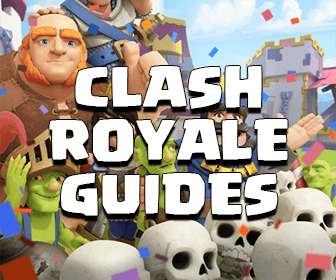 I am gonna tell you all about them in this Clash of Clans Guide! Basically, the way Town Hall 9.5 works is the same as TH 8.5 so I will just talk about the TH 8.5 in this guide. What are Town Hall 8.5 and 9.5? Basically, Town Hall 8.5 is a Town Hall 9 which doesn’t have any Town Hall 9 defensive buildings and troops. 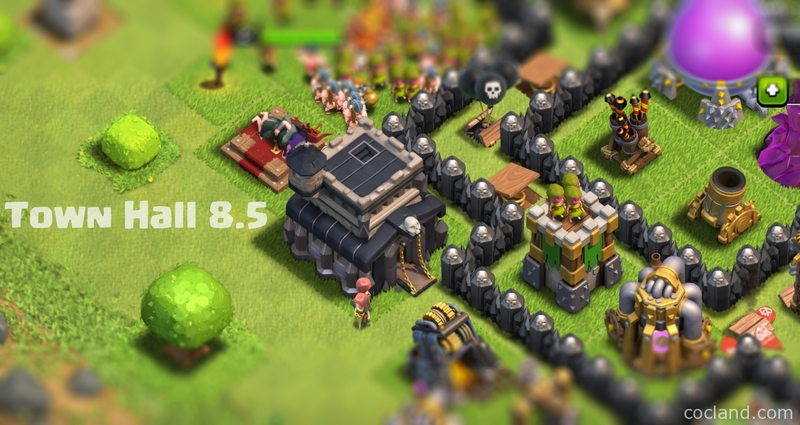 Don’t buy any new defense (Archer Tower, Air Defense, Tesla, Wizard Tower) and don’t upgrade your walls to level 10. 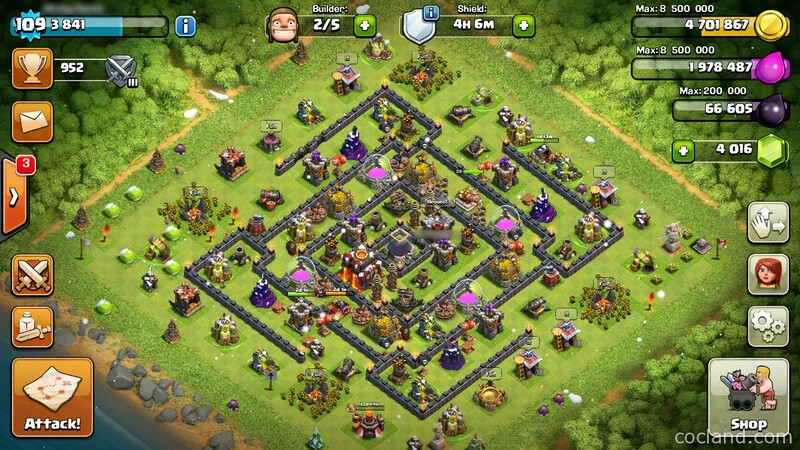 You can upgrade all your current TH8 defensive buildings, Troops, Army Camps, Spell Factory, Clan Castle, Laboratory and Archer Queen to their max level at Town Hall 9. Don’t upgrade walls to their maxed level or they will affect a lot to this strategy. You should work on your troops before working on your defenses. If you want to build a TH 8.5, level 8 walls are enough and they should be level 9 If you want to build a TH 9.5. You also should not upgrade your Dark Barrack because it will unlock new troops, which can increase the weight of your base. If a rushed Town Hall 9 has 2 maxed X-Bows, it can outrank most maxed Town Hall 8s. Especially as a decent TH10, no matter how the rest of your village is, with maxed Inferno Towers, you can easily win the battle against TH9 players. These two defensive buildings have the highest scores at match making. As a Town Hall x.5, your main priority should be getting your Archer Queen and Barbarian King to high level as quick as possible. Also, at this time, the most popular attacks at Town Hall 9 and 10 are evolving around Golems, Hog Rider and Valkyrie so you will want to focus on upgrading them too. You will want to focus on your troops first, before working on your buildings. 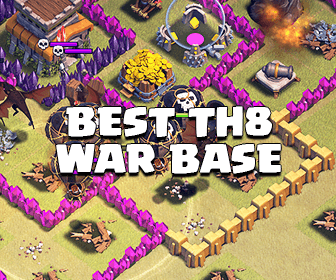 As long as you can 3 star your own base, you are ready for Clan Wars! Please take a look at War Focused Upgrade Priority for more details! It’s an in-depth guide that must be read. What is the benefit of being a Town Hall 8.5 or 9.5? By being a Town Hall 8.5, your score (weight) at Clan War Matchmaking is the same as when you were at Town Hall 8 because the number of your defensive buildings doesn’t change. Your rank in Clan Wars now should be the same as when you were at TH 8 but the advantage here is that you can easily bully all TH8 bases with the new TH9 troops, also, the TH9 players of the enemy Clan will have to attack you while their TH8s can’t. You can save a lot of stars for your Clan. So Rushed Town Hall is not always bad, right? Imagine, If your Clan has 10 TH 8.5 villages in Clan War, you can win the war every time LOL. You should also read this guide to know how we can weigh our bases exactly. Then you will know how to upgrade your defenses as well as troops properly. This method has been confirmed by thousands players and I strongly agree with them. It works well with lower Town Hall levels such as TH 7 or TH 6 but they aren’t mentioned too much because it is just not worth it at all for being a TH7.5 as the opponent TH7 players still can 3 star your base with Dragon attacks. Okay I hope you have enjoyed this guide. Don’t hesitate to comment If you need any help guys! You rock!